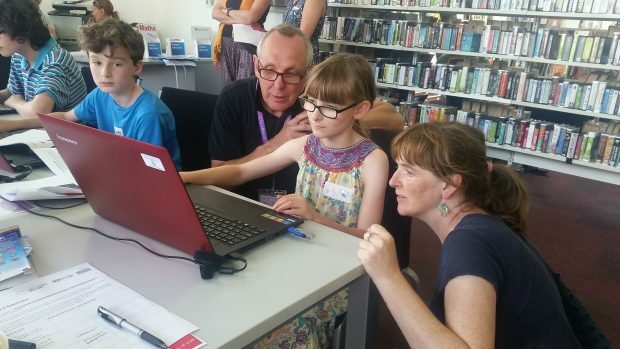 When East Sussex County Council received news that we had been one of only 30 recipients of the Libraries Opportunities for Everyone Fund (LOFE) back in March 2017, we were excited that we had the funding to be able to trial 6 new pilot projects. We needed to get the ball rolling quickly to ensure we maximised the opportunity. Advantage East Sussex, the title of our project, was focussed upon trialling new projects which we thought might be able to inform or be included in the East Sussex Libraries Strategy, due to be launched in 2018. Although there were 6 different projects, the common theme was around supporting our more disadvantaged groups in the county, and focussing on communities (both of people and place) in areas of high deprivation. This part of the programme was to deliver Code Clubs out of library opening hours in our libraries in Hastings, Eastbourne and Lewes. Three libraries were chosen for their ability to support 8-12 year olds, and for practical reasons, such as having a suitable layout with computers in clusters so that volunteers could support a group of up to 12 children. Over the year we recruited several volunteers, worked with Code Clubs to train our volunteers, and delivered the Code Clubs curriculum to 40 children. We encountered some challenges with recruiting and retaining volunteers, and in one area we competed with lots of other after school clubs to attract children. We made some fantastic links with a local CIC, Tech Resort, who we funded to deliver additional one off sessions in libraries over the school holidays. This allowed children across many more library locations to have a go at 3D printing and introduced new audiences to Raspberry Pi. We also got involved in the Micro:bits in libraries campaign as a result of an increased awareness in all things coding in libraries, and we were given 110 micro:bits. These have been loaned over 450 times in the first 6 months, reaching a large teenage and female audience. Since the end of the funding we have continued to deliver Code Clubs, moving them into core library opening hours; we have expanded our Code Club locations; and we now host 5 Code Clubs across the county, meaning we regularly reach over 60 children a week, teaching them the coding languages of Scratch, Python and HTML. This project was a volunteer delivered session, focusing on giving customers with basic IT skills the ability to job seek, access services and apply for jobs online. The volunteers are trainers, supporting and coaching customers through their journey to gain the skills they need to achieve their work related goals. A Volunteer Coordinator trains and manages the volunteer trainers. They monitor the sessions and the bookings to ensure they are well attended but not oversubscribed and make sure the volunteer trainers have all the resources they need to support the learners. Recruiting volunteer trainers went surprisingly well, the feedback being that getting to see the development and progression of the customers attending the sessions really has the ‘feel good’ factor. Initially we focussed on coastal towns, and we have expanded this project to include 7 libraries, supporting over 100 people a year. Even after the funding had finished, we had so much success that we intend to employ an additional volunteer coordinator, with part of their role to continue this project, embedding it further into the service. When we were coming up with ideas for our LOFE bid, a librarian mentioned hosting our usual rhyme time and story time events but tailoring them for a refugee and migrant audience. There was a well-established community in the Hastings area which we felt able to support by holding sessions for pre-schoolers and singing in English and in their first language. When we met with the organisers of The Links project (a drop in centre for refugees and new migrants) they mentioned there were over 50 different languages being spoken, and that everyone wanted to learn English, so we quickly adapted our sessions to teach children nursery rhymes in English. The project began slowly, and it took time to gain the trust of the centre and those accessing its services. Each week we turned up and sang rhymes, sometimes to only a couple of children, who would wander off if they were no longer interested. During school holidays older children would also attend, but due to the nature of the community there was a constant flow of new people, and people moving from the centre. Over the year we met over 30 children and families. At the end of the funding we invited the group into the newly reopened Hastings library for one final rhyme time in our new Children’s area, signing up families to the library and encouraging them to use the new library. To support visual impaired people (VIP), the library service bought both Eye pal SOLO and Prodigi machines for some of our largest libraries (plus a machine for the library in HMP Lewes). We also installed screen reader software on over 200 People’s Network computers across all of our libraries. We ran sessions for VIP and made good links with our local Blind societies, attending their open days to promote the new equipment to their clients. We delivered training to our staff to enable them to support people using the hardware and software and also to raise awareness of the additional needs of those with a visual impairment, and invited the RNIB and Share the Vision to deliver a training day to staff from across the service. As the project progressed we also inducted 2 volunteers with visual impairments themselves to train others on the equipment. 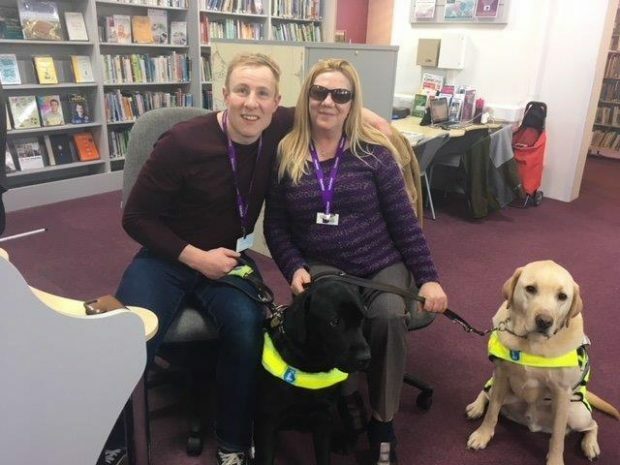 Having regular sessions in the library with our volunteers and their guide dogs also meant we were raising awareness to other library customers as well, and the sessions led to lots of impromptu conversations about our offer to our customers. We also developed this part of the project to use the equipment to support children with dyslexia, as the text-to-speech function supported their learning, and teachers were really positive of the sessions our librarians ran. Part of the funding was reserved to develop “wellbeing boxes”. 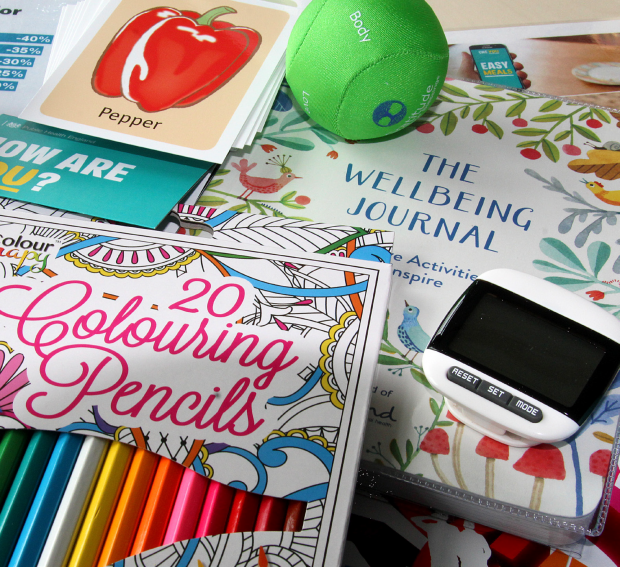 These are loanable boxes for adults to support their mental wellbeing, and include items such as a pedometer, stress balls, colouring in books for adults and pencils, a mindfulness journal plus lots of information signposting people to further support from local and national organisations. We promoted these heavily with our colleagues supporting vulnerable adults and received a hugely positive response about the resources. As soon as we began lending these out, we couldn’t keep them on shelves in libraries, with reservations from across the county. We began making even more boxes up to satisfy demand. 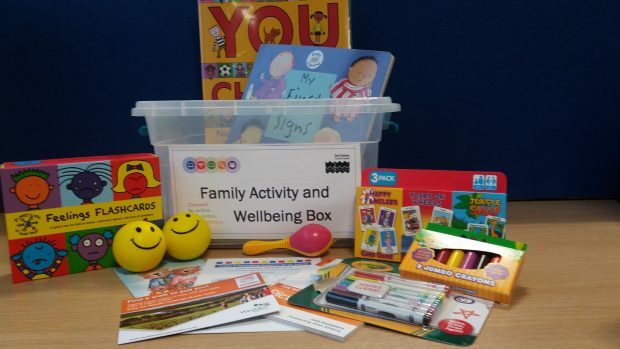 As word spread, colleagues in children’s centres started to talk about how useful a children’s wellbeing box would be, so we expanded the project to include family activity and wellbeing boxes. Activities included in the boxes for children up to the age of 12, and activities that families could do together. These are going to be loanable from the library, and also from children’s centre staff as well. Finally we also developed wellbeing bags for a teenage audience, focussing on triggers such as body image and exam stress. To promote these items we held launch events, and we worked with CAHMS to deliver a 3-part creative writing workshop (delivered by our writer in residence Alan). This project really grew with demand, and has got a lot of people talking about what the library can offer and support with, which has been great for us to be able to build new partnerships and open new doors. We used the funding to purchase stock (and additional resources to cover losses) so although the LOFE funding has finished, we are still able to offer these resources. Our new Hastings library was due to open in 2017, but contractors discovered that additional structural work needed to be carried out which resulted in a delay to the reopening of Hastings library. 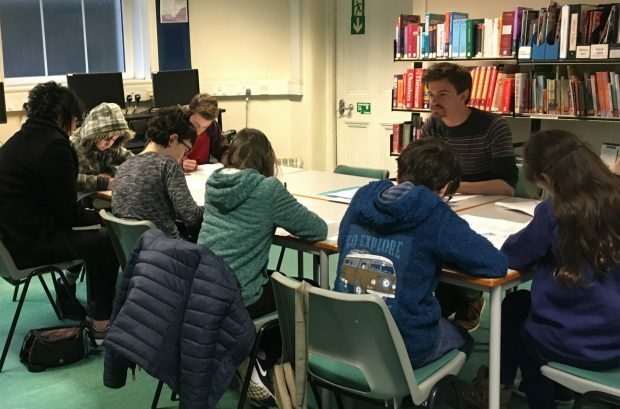 This didn’t deter us from securing a great Writer in Residence, Alan Ward, to encourage young people from the Hastings community to use the library service. We adapted our original plans and Alan’s residency became much more about going out to meet people in schools, clubs and other town centre locations to deliver creative writing workshops. We pushed the residency right back into the first few months of 2018, so that we had 4 weeks of the 12 week residency in the newly refurbished library, and we worked around the much smaller space in the temporary library, hosting sessions there when we could. Part of Alan’s remit was to contact and engage with different community groups, which for us meant that we could focus our time on the library reopening. We asked Alan to use his creativity to shape the residency, and gave him free rein to produce whatever output he thought was best. We ended up with a great booklet which includes lots of the workshop participants’ writings, and a special piece Alan wrote for us. Alan has also written a great Taskforce blog post, so check that out for more of his thoughts on the residency. Overall the LOFE funding enabled East Sussex Library Service to trial new ideas and test projects, with financial backing to ensure that we were able to properly resource the projects. With the funding also covering additional headcount, we were able to bring new people and new ideas into the service. From the very beginning we thought about the sustainability of the projects after the funding finished, and as a result we are pleased that many of the pilot projects have now been embedded into the service. To keep up to date with activities in East Sussex libraries, follow them on facebook, or look at their website.